Moles spend almost their entire life underground. The eastern mole is the most common species of mole in Illinois; the star-nosed mole (Condylura cristata) is rare in the state. 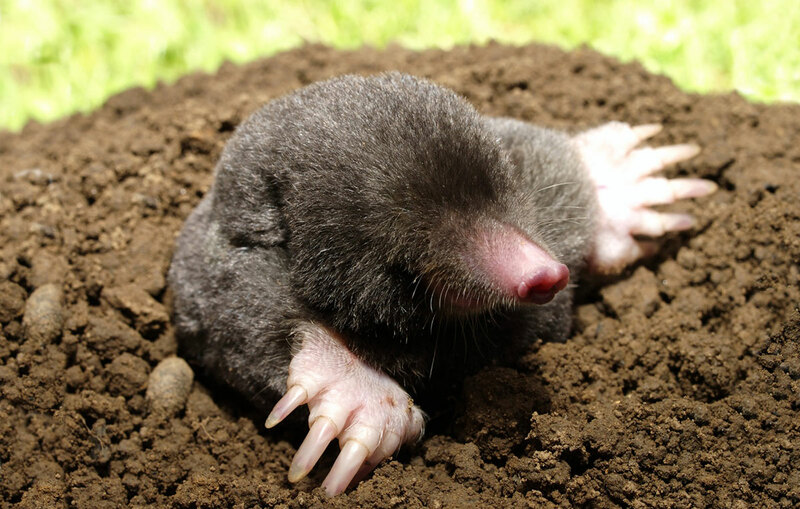 Moles aerate the soil with their tunneling. Eastern moles are small mammals, five and a half to eight inches long, and weigh one quarter pound. They have charcoal gray fur that is extremely soft and plush. The fur offers no resistance when pushed in either a forward or backward motion, which helps the mole move easily through its underground tunnels. Individuals may have white or orange patches of fur on the underside. Eastern moles have front feet designed for digging. Moles have large, webbed front feet with five toes on each foot and large claws for digging. The hind feet are smaller but are also webbed and have five toes. The feet and snout are nearly hairless and are light colored, almost pinkish-white. The snout is very narrow and the nostrils are on the upper surface rather than at the end of the snout as in most mammals. Moles can easily be distinguished from pocket gophers, since moles appear not to have any eyes or ears. The eyes of a mole are hidden by their fur and covered with a thin layer of skin. The eyes alert the mole to changes in light intensity. They have no external ears, and their tails are short and nearly hairless. 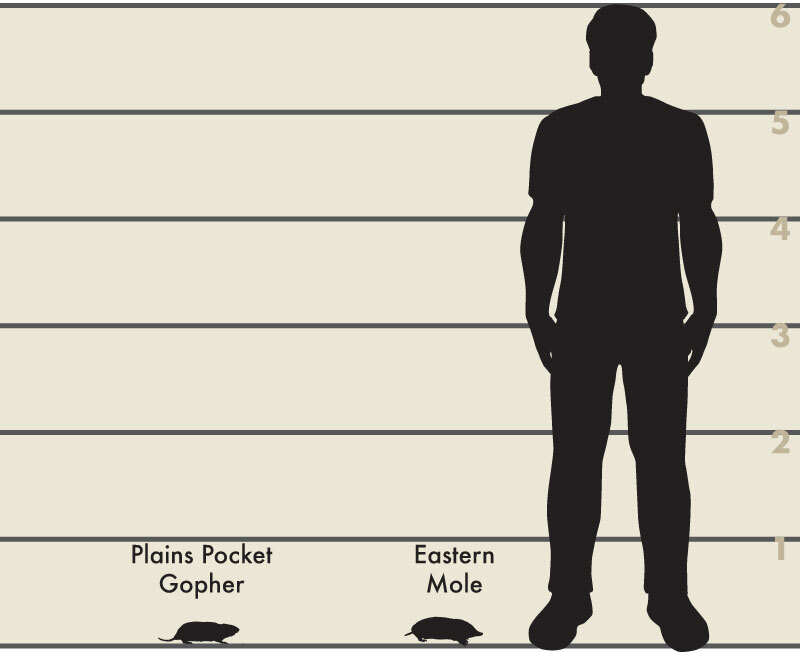 Size comparison of a six-foot tall man, a mole and a plains pocket gopher. Since moles live underground they do not usually leave tracks or droppings on the surface. Their presence is indicated by the molehills (piles of recently excavated soil) and tunnels that they create. The burrow can be found beneath and in the center of the molehill, whereas a pocket gopher’s burrow is off center or nearer one edge of the soil mound it excavates. Eastern moles are found throughout Illinois. It is estimated that in good habitat, an acre of land can support three to five moles. Moles are solitary animals and are active year round. They build two types of tunnel systems. The tunnels most often encountered by people are the shallow hunting tunnels. These appear as narrow trails of slightly elevated, cracked ground and compact easily underfoot. Once this type of tunnel is dug it may be used again for later hunting expeditions or the mole may abandon the tunnel. The second tunnel system is typically 12 or more inches below ground. This tunnel system is used for rearing young and resting. The tunnel system is used for hunting during the winter, since it is below the soil’s freeze line and the mole still has prey available to it. Molehills are created when the mole pushes soil up to the surface when digging out the deeper tunnels. The burrow entrance is beneath the center of the soil pile. The hills typically have a diameter of less than 12 inches and are five to eight inches deep. The mole plugs any opening in the hill with soil. Most digging takes place when the soil is moist, which is why tunnels may seem to appear suddenly after a heavy rain and after snow melt-off. While molehills and tunnels may be an inconvenience, they are evidence of a healthy ecosystem. Where possible, mole activity should be allowed to continue. Moles eat large numbers of grubs, worms and insects, and they help aerate the soil. Moles pose no public health concerns. Soil type is more important to moles than the type of vegetation that is growing in the area. Moles can be found in woodlands, pastures, meadows, gardens, lawns, agricultural fields or other areas so long as the soil is sandy or loamy and well-drained. They avoid soil that is too rocky, sandy or wet or soil that has a lot of clay in it, since these soil types are harder to maneuver through and do not provide good conditions for the moles’ prey. Moles are insectivores and eat mainly insects, larvae, grubs and earthworms. They are opportunistic feeders and will eat slugs, snails, millipedes, centipedes, and spiders. Moles will also eat plants such as the seeds of corn, grasses, oats and wheat. Female moles have one litter of three to four young each year. The gestation period for moles is not well-known, but is thought to be about 42 to 48 days. In Illinois, litters are born in late February through early June. The female has the young in a grass-lined nest in one of her deeper tunnels. The young are born without fur, and will stay in the nest until they are about four weeks old. They begin to venture out of the nest at four to five weeks of age, and will be the size of an adult mole when they are three months old. It is thought that moles live from three to six years. Since they rarely come to the surface they are somewhat protected from predators. Hawks, owls, cats, raccoons or dogs may kill those that do venture above ground. Foxes or coyotes may dig moles out of their tunnels, and snakes and badgers may take moles above or below ground. Flooding can be a major cause of mortality, especially for the young. Humans also kill many moles when trying to prevent damage to lawns or other areas. 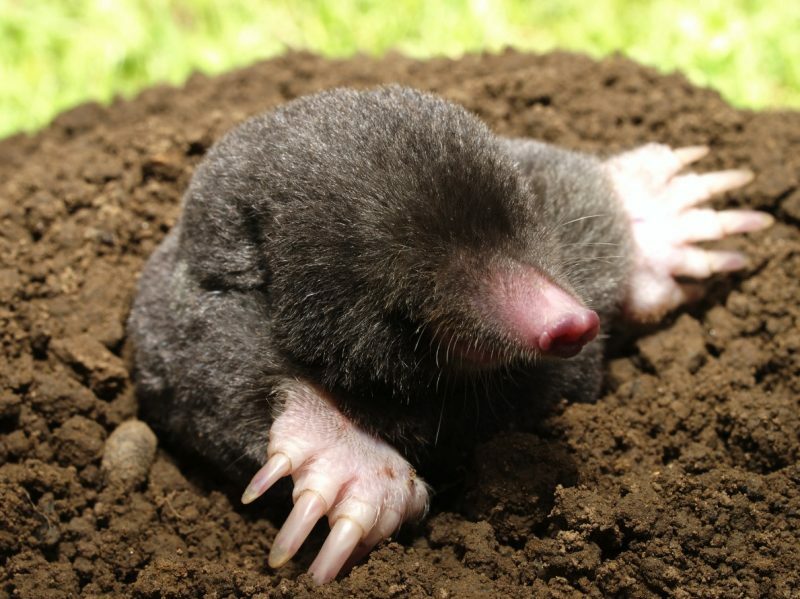 The tunneling behavior of moles can damage lawns or garden plants by damaging plant roots. Their surface tunnels and molehills may be considered unsightly in a manicured landscape. Mole tunnels may also give mice and voles access to seeds and tubers. Before beginning a control plan, it is important to make sure that moles are causing the tunneling and mounds of soil. The plains pocket gopher (Geomys bursarius) also occurs in Illinois and lives a subterranean life similar to the eastern mole. Moles excavate circular, volcano-shaped mounds of soil. The mound of soil is typically four to eight inches high but may extend up to two feet. The pocket gopher excavates kidney-shaped mounds of soil. Moles are attracted to areas with a good supply of food in loamy soil. Therefore, in a healthy environment it is extremely difficult to get rid of moles. In an urban setting such as a lawn or golf course, it may help to use insecticides to reduce the grub and insect populations. Always read and follow the directions on product labels. Keep in mind that insecticides will kill beneficial insects in addition to the grubs and can have negative impacts on wild birds and other species. Treating an area with insecticides should not be considered a long-term solution when dealing with moles. Packing the soil with a lawn roller may make the area less attractive to moles, but this technique can hinder turf growth. It is possible to exclude moles from small areas by using a barrier made of hardware cloth. The wire must be buried at least twelve inches deep. Dig a trench at least 12 inches deep by 12 inches wide. Using a piece of 24 inch wire, bend the wire at a 90o angle and place it in the trench with the lower piece facing out from the area to be protected. Replace the soil, making sure that the wire is flush with the ground and is completely covered. There are no registered repellents for mole control in Illinois. Frightening devices, such as ultrasonic emitters, have not proven to be effective. Baits treated with zinc phosphide (usually peanuts or grain) are sometimes used but since moles eat insects and worms they do not usually take the poisoned bait. Additionally, because zinc phosphide is highly toxic, it is registered as a Restricted Use Pesticide and only licensed pesticide applicators may use the product. Toxicants are not recommended for mole control. Fumigants are typically ineffective and are not recommended for mole control. Trapping is the recommended control method for moles. Harpoon, scissor-jaw and choker traps are the most widely used. A permit is not needed to trap moles. Following trap instructions will increase the success of this control method. 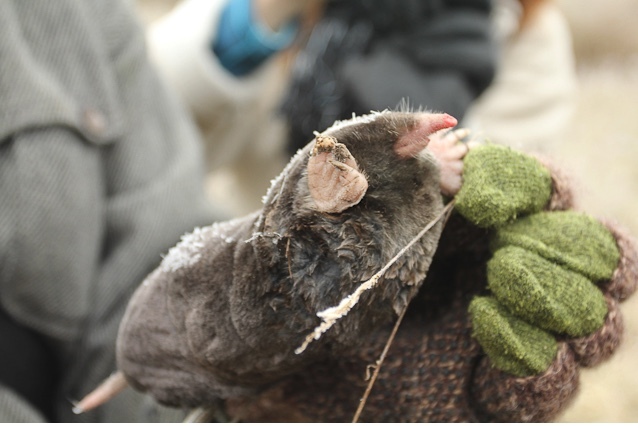 The Internet Center for Wildlife Damage Management provides a detailed guide to trapping moles (Trapping Moles). Keep in mind that removing one or more moles will open up the area to invasion from other moles. If the soil conditions are good and there is a food supply, moles will continue to use the area. 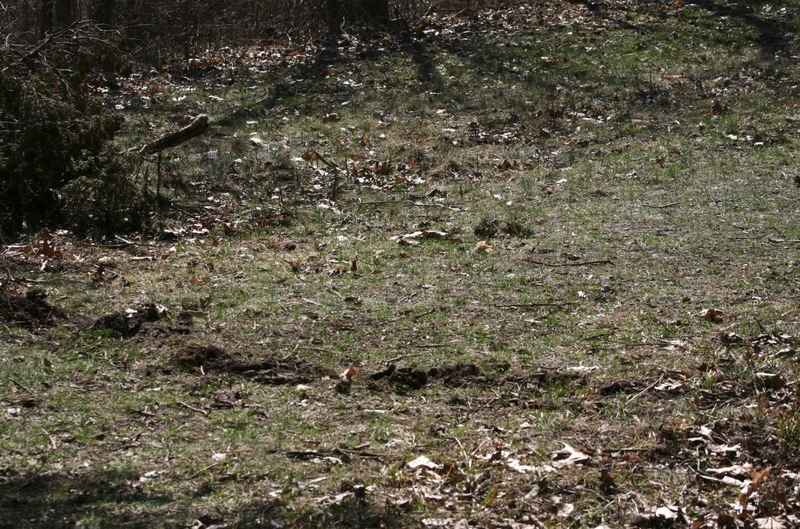 In Illinois, moles are not protected by the Wildlife Code. They may be removed without a permit.